It is a bright spring Sunday afternoon. My friend Lisa is on her horse Secret, I am on Harvey, and we are ambling through a little woods on the expansive farm where we both board our horses. We are arguing. Or rather, I am presenting an argument. "We don't DO trails Lisa. Harv will spook and step in a hole. He will bolt and I'll end up wrapped around a low-lying branch." "If you try to turn around, I'll grab the reins," Lisa counters in a singsong voice. I realize that whining will do me no good. The barn owner, Jenny, has asked us to visit a neighbor and test the footing he has just installed in his outdoor arena. She wants to know if we like it. The neighbor, who everyone calls Marlboro Man, is several miles away. To get there we must cross a covered bridge and go through fields, woods, and a stream. In the two years I have owned Harvey I have never trail ridden -- too dangerous, too many unknowns, and besides, the payoff is not that great. If I want to be surrounded by nature I'll hike myself. If Harv was hurt on a trail, I would not forgive myself. Lisa, on the other hand, is a seasoned trail rider, and her 14.3 Morgan -- the old "chunky style" version of the breed -- is her perfect partner. They are walking a bit ahead of me, Lisa's shoulder near Harv's head. She really will grab the reins. With a grim face, I resign myself to the trip. We are on our way. Lisa knows the way to Marlboro Man's house. She has been past his property many times-- actually she sort of stalks him, as do several of the single female boarders. He's a tall, ruggedly handsome cowboy type, a man of few words, and very cool. Picture Anthony Bourdain in a cowboy hat, without the NYC sensibilities. Our ride to the property is uneventful. Harvey and Secret are pasture buddies, and they walk along companionably. We go through a chest high stream, and although I can feel Harv's heart pounding in my calves, he seems more elated than scared. I dismount and walk him through the covered bridge, just to be safe. We finally arrive and ride into the Marboro Man's barn area. To Lisa's delight, Marlboro Man is in the ring riding a little buckskin. He is expecting us. He nods, but doesn't speak. Lisa sidles up to him and asks about the buckskin. 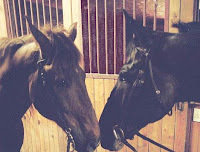 They chat while I test out the footing. The footing, the ring, the barn, and the pastures are all beautiful, and we spend about an hour riding around. Lisa is talking animatedly to Marlboro Man about the barn setup and upgrades he is contemplating. I suspect she is already imagining what it would be like to live here. As we prepare to leave, Marlboro Man offers to show us a shortcut. Lisa flushes and says yes, that would be wonderful. I'm all for a shorter way home. Maybe we can avoid the covered bridge. We walk past where we entered the property and head into the woods. It's rougher than the manicured trail we were on, and our pace slows in the overgrown, uneven terrain. I worry about my 17H thoroughbred with size 3 shoes. The spring rains have softened the footing, and he could slip. We walk for perhaps fifteen minutes. Then, up ahead of me, I see Marlboro Man starting up an embankment. Lisa follows close behind. I watch as their tiny-hooved, nimble horses slowly pick their way up like mountain goats. My heart sinks. The embankment is 15-20 feet high, muddy, and steep. Within a few minutes Lisa and Marlboro Man are staring down at me. Had we been alone, I would have had some choice words for Lisa. This was precisely the kind of thing I'd feared! I can't take the old path back to our barn -- I'm not even sure I can retrace my steps. But I do NOT want to attempt that muddy embankment. In my mind's eye I see Harv slipping, scrambling, and falling backwards. I look to my trail partners for a solution. "Is there another way up?" I ask. "Harvey can't do this." Marlboro Man looks around, mostly for effect, I think. "No," he says. "No other way." Lisa is silent. She does not say, "Hey, this is a cinch." She does not say, "It's just an little incline." Neither of these things is true. She also does not say, "Never mind, let's go home our regular route." I glare at her, but she is staring intently at her saddle horn. Then Marlboro Man suggests, "Just drop the reins and kick him on." In the end, Harvey makes the call. He is more than a little aware that we are not with the others any more. His ears are pricked intently, and he is ready to go and be with Secret. I drop the reins, and he needs no urging. He trots energetically toward the embankment. I feel his hindquarters lower as he gathers his hocks and launches himself upward. I grab mane and lean forward. With each stride his hooves land and slide backward in the soft mud; he launches himself again even while he is slipping down. In four prodigious leaps he clears the embankment. We have made it to the top through sheer momentum. We could never have picked our way up, as the others did. Had I tried to guide him we would have fallen or slid backward. Coming to rest at the top, I pat his neck with both hands as if we've just won the Derby. Harvey has trail smarts! Who knew? Harv is bright-eyed and enormously pleased with himself. Lisa catches my eye and makes a thumbs up sign while still holding the reins. I look expectantly over to Marlboro Man. To my disappointment, he has already turned away from us and is heading up the trail. Jerk, I think to myself. Thoroughbred hater. Then suddenly his broad, denim-clad back swivels around, and he's turned in the saddle toward me. I absorb the full force of his handsome craggy face and his kind, smiling eyes. Did I say Anthony Bourdain? I meant Gary Cooper. Now I'm flushed. He pushes his hat back on his head, wearing an expression of pleasant surprise. He nods toward Harvey. 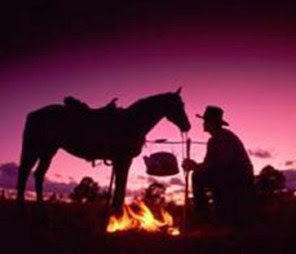 "Now there's a horse you don't mind feedin' every day." It is the longest sentence he has ever uttered in my presence. And it is the perfect thing to say. When we returned to our boarding barn, Lisa recounts the story to Jenny, and Jenny tells lady boarders who are smitten with the Marlboro Man. They swoon at Marlboro Man's folksy wit. Harvey wins new respect among these women, who now regard him with awe. He's not just some thoroughbred, he's the "horse you don't mind feedin' every day." Well, twice a day, actually. So this concludes Harv's adventure. 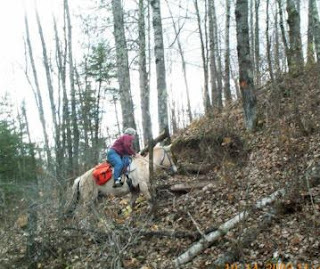 To the left is a shot of Harv and Secret around the time of the trail ride adventure. Harv is 21 now, which makes Secret 36! Great story - I was right there with you looking up that hill! I don't blame you for being scared - I would have been a wreck standing there at the bottom of that embankment! I bet it made it that much rewarding when Harvey showed off his trail smarts by bounding up. What a good boy! asThis brought tears to my eyes! Hero horse! Hug your horse for me! Isn't it amazing what they will do for us? Not only go around in boring circles but up dangerous mountains also. Hug your horse! PS Lots of Marlborough Men around here. Go Harvey! See, TB's can too trail ride! The horse knows the way, as they say! Oh, and Tyson Girl, I never found out what happened to MM. Was a pleasure to read! Go Harvey! Go Stacey! I'm a trail-riding ninny too. Heck, I'm just a ninny in general, so your story made me nod my head and laugh. I've had similar I-can't-do-it experiences. Usually mine don't end as well as yours did. Oh, and wonderful, descriptive writing, as always. Stacey, you know how embarrassed I am to chime in on your posts because I'm horse knowledge-impaired. But I must come out of hiding to say that this post got me misty-eyed. Harvey is awe-inspiring! And your writing is novel-quality. I so enjoy reading your entries. Thank you for this. What a treat! love it! thank you for that! Laughed out loud and smiled the whole story through...as usual. What a great story. Your horse sounds awesome! Such a good boy. What a phenomenal story! I often say, most people don't realize what his/her horses are really capable of. We try to hold them back a lot, or don't believe in them. This is a perfect example of you saying, "Harvey can't do that." and Harvey replying, "Oh yes I can!" He sounds like my kind of horse!